The street on the left is King Edward Street and the street on the right is St. Martin’s Le-Grand. 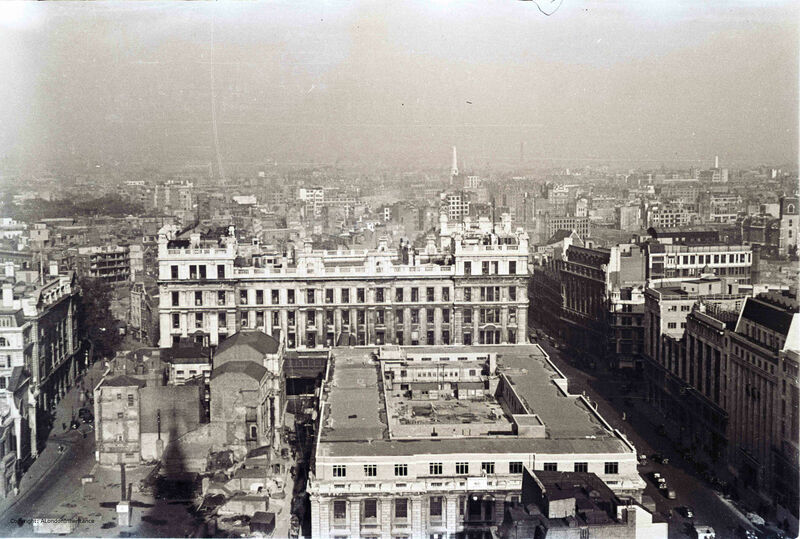 The large buildings that occupy the space between these were General Post Office buildings with the larger building in the centre of the photo being the headquarters of the General Post Office. Whilst the roads are still in the same position, the view again is very different. In the following photo, apart from the streets my only reference points are the building on the extreme left of the photo and the church tower of St. Giles, Cripplegate on the right. These appear to be the only buildings that remains from the immediate post war period. Now walk a few feet to the left and look out over to Christchurch Greyfriars. Newgate Street is running left to right with King Edward Street heading north from Newgate Street. And the same view today. The body of the church has been left to this day as it was after being destroyed in 1940. Flower beds now occupy the space where the pews once stood. Apart from the church, the building just behind the body of the church also remains. 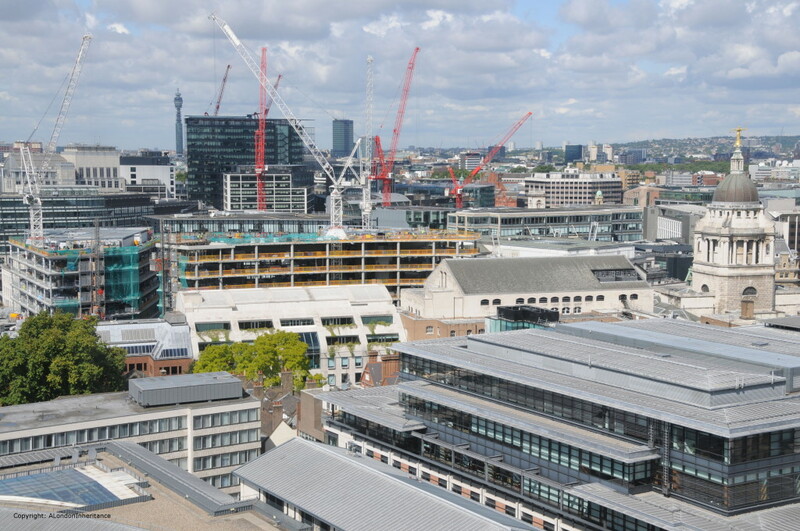 The above photos and the ones below are looking down on the area of Paternoster Square and Paternoster Row. Paternoster Row was mentioned in the thirteenth century when Stow states that it was built around 1282 and that rents from the houses were used for the maintenance of London bridge. Before the war, this area was well-known for book publishing, distribution and warehousing, a fact that contributed to the intensity of the fires that raged in this area. This trade started well before the 20th century. It was in Paternoster Row in 1720 that William Taylor published Robinson Crusoe after Defoe had tried all over London to sell the manuscript. In 1724 Taylor’s publishing business was purchased by Thomas Longman who had founded the publishing firm of Longman, Green and Company also in Paternoster Row. Longman is still an imprint today, owned by the Pearson publishing company. The following paragraphs are from the book “The Lost Treasures of London” by William Kent and give some idea of the dreadful loss to the long-established businesses that use to thrive in the City. On the night of the 29th December 1940, Simpkin Marshall, Ltd, the greatest distributor of English books in the world, carrying the largest comprehensive stock, lost approximately four million books when their premises in Ave Maria Lane, Stationers’ Hall Court, Stationers’ Hall, Amen Corner, Paternoster Row and Ludgate Hill, were entirely destroyed by the incendiary bombs of the enemy. As a result of the blitz, Simpkin Marshall went out of business. 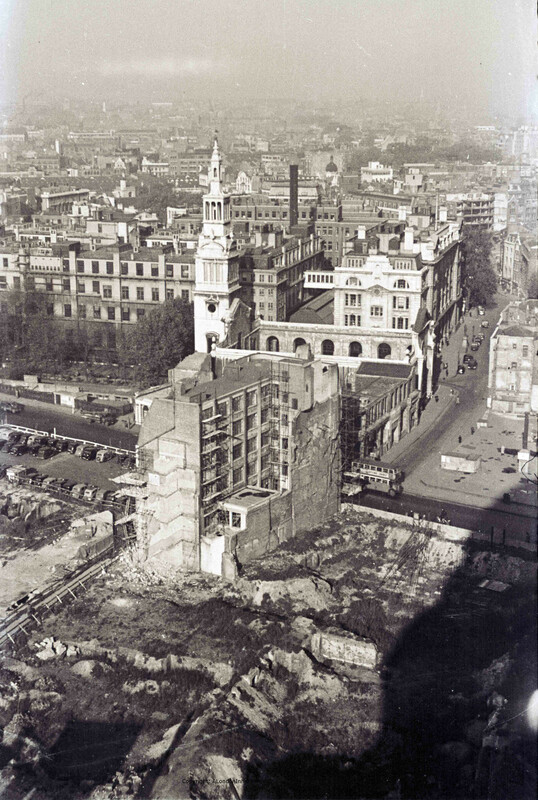 It is hard to imagine the loss that must have been felt when Londoners returned to their place of work after an air raid and realised not just the loss of the buildings, but also what was held within and long established businesses. Turning a bit more to the left and peering down we can get a glimpse of the Chapter House and the road that was St. Paul’s Church Yard that closely circled the cathedral. The five circular shapes just behind the Chapter House are the impressions left by water storage tanks. Access to water was always a problem during the blitz. Damage to water distribution pipes, blocked roads and low tides in the Thames all contributed to the lack of the plentiful supplies of water needed to fight the sheer number of fires that would take hold after a raid. After the Paternoster area was destroyed on the 29th December 1940, the area was quickly cleared and these water tanks were built and kept full ready for the next raid. 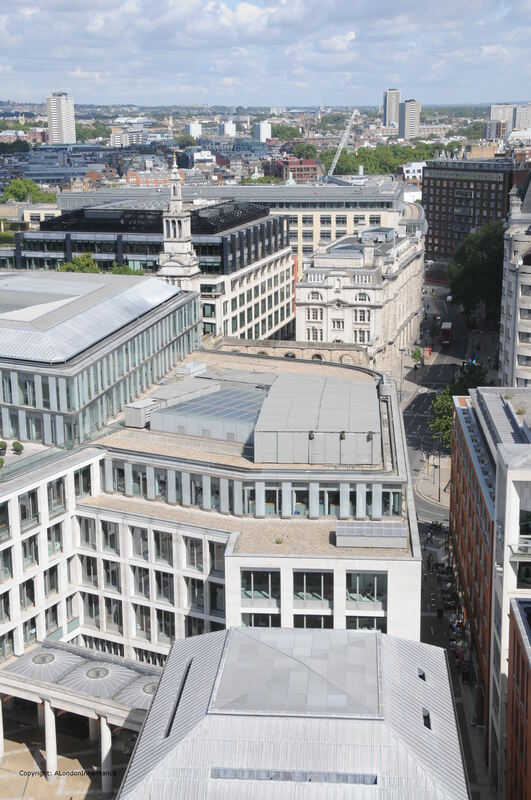 Further back can be seen the rectangular shape and surrounding streets of Paternoster Square. I was able to frame the following 2014 photo reasonably well using the statue at the bottom right, to take a photo in exactly the same position as my father 67 years ago. The current incarnation of the Chapter House is currently undergoing re-building / restoration work hence the protective covering. Now look up again and walk further to the left and out across to the west. 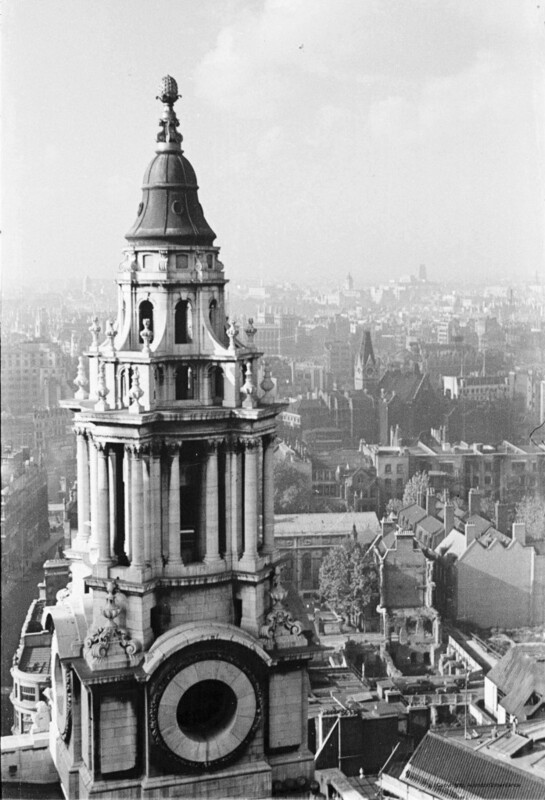 In 1947 the Old Bailey with the “Lady of Justice” holding the sword and scales of justice stand well above the surrounding buildings, with the Senate House of the University of London the next tallest building in the distance. 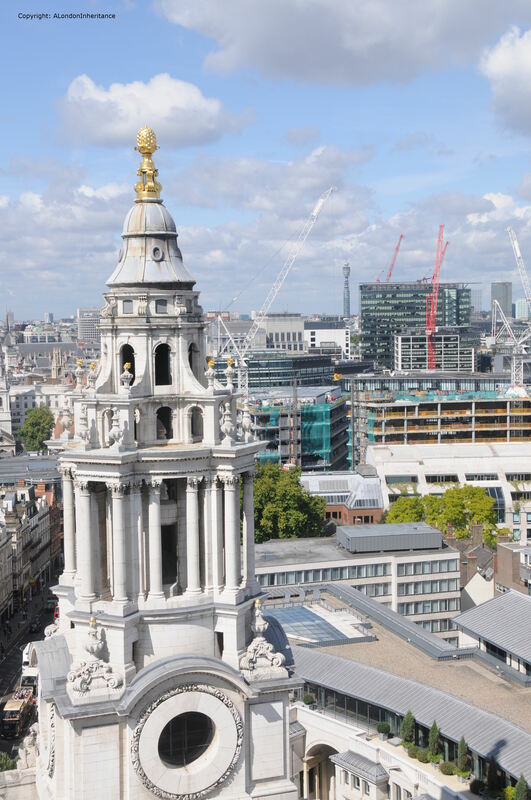 In 2014, the Old Bailey still stands clear but the rest of the view towards the west is very different. The view of the Senate House is now obscured, and the next tallest building on the horizon is the BT Tower. Turning to look further to the left, we can see one of the western towers at the front of St. Paul’s. Looking at these towers at the front of St. Paul’s, at the Dome, across the different levels of roof across the cathedral, the many small walkways, along with the many stairways leading up to the heights of the cathedral really bring home the complexity of protecting the cathedral during the air raids of the blitz. “The Watch was now forced back on their reserves and had to rely entirely on stirrup pumps and sandbags. How we blessed the prescience of our commander, who had insisted on having our supplies of reserve water augmented in case of an emergency like that which we now confronted. Tanks, baths and pails full of water with their compliment of crowbars, shovels and other fire-fighting equipment were now liberally installed in all the vulnerable parts of the building and were so arranged that men approaching the scene of the fire from any direction would be certain of finding the necessary appliances to hand. But for these precautions there might well have been a different story to tell of the fate of St. Paul’s that night. The action in the cathedral became for a while a number of separate battles in which small squads fought incipient fires at different places on and beneath the roofs. Some of the bombs were easily dealt with, as for example that one which fell on to the floor of the Library aisle and was extinguished by Mr Allen and myself. I have a special affection for the scar left by that bomb on the floor – it represents, I feel, my one little positive contribution to the defeat of Hitler ! But some of these battles were arduous and protracted. Bombs which lodged in the roof timber were very dangerous and hard to tackle. More than one of these took three-quarters of an hour before they were put out and had to be attacked by two squads, one from below and the other from above. The lower squad had the additional discomfort of being drenched by the pumps of their more elevated colleagues”. The account also makes clear the need for a “head for heights” when working in the roof spaces and above the cathedral floor. It is the bravery of the Fire Watchers that we have to thank for the survival of the cathedral. Now for the final view from the Stone Gallery in 1947 and we are looking out over the southerly of the western towers across the River Thames to Westminster. We can see Waterloo Bridge along with the Shot Tower on the south bank of the Thames. And in 2014, the view of the river and Waterloo Bridge remain but there has been considerable change on both banks of the river. 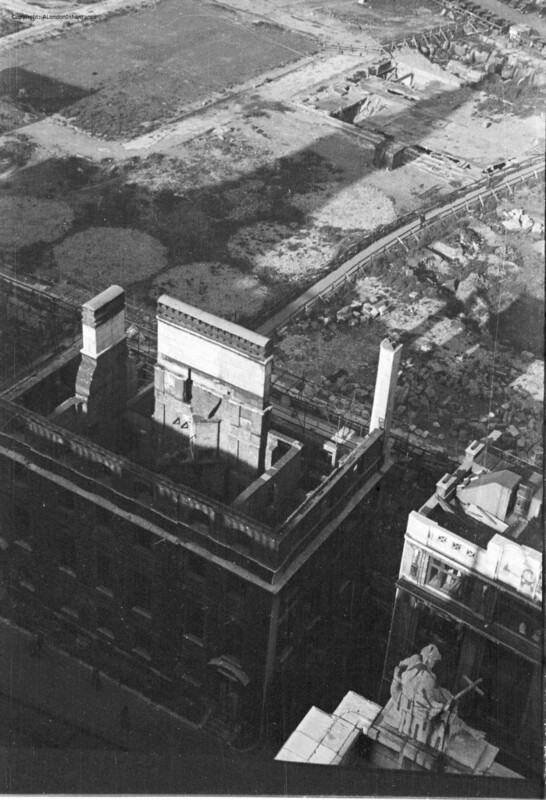 In the 1947 photo, the south bank would soon be cleared for the Festival of Britain, after which the site was part occupied by the Shell Centre building then continuous development leading up to the London Eye. In the foreground in the extreme lower left of the photos is St. Benets, Paul’s Wharf. 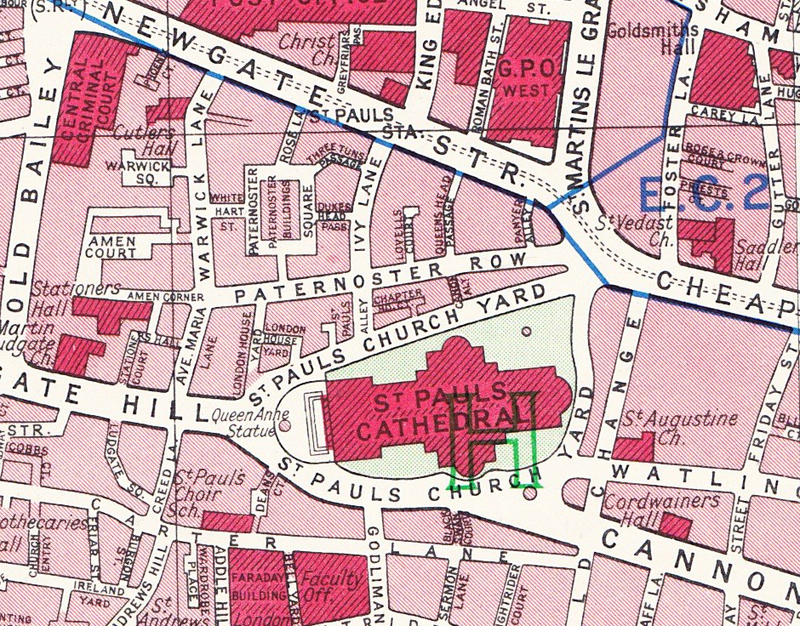 The following map from Bartholomew’s 1940 Reference Atlas of Greater London covers the area to the north of St. Paul’s and shows the streets between St. Paul’s Church Yard and Newgate Street. This was the area shown in the photos covering Paternoster Row and Square and shows the many small streets that were occupied by numerous businesses including that of Simpkin Marshall Ltd. These were soon to be lost with the rebuilding of the area over the coming decades. That completes our walk around the Stone Gallery. 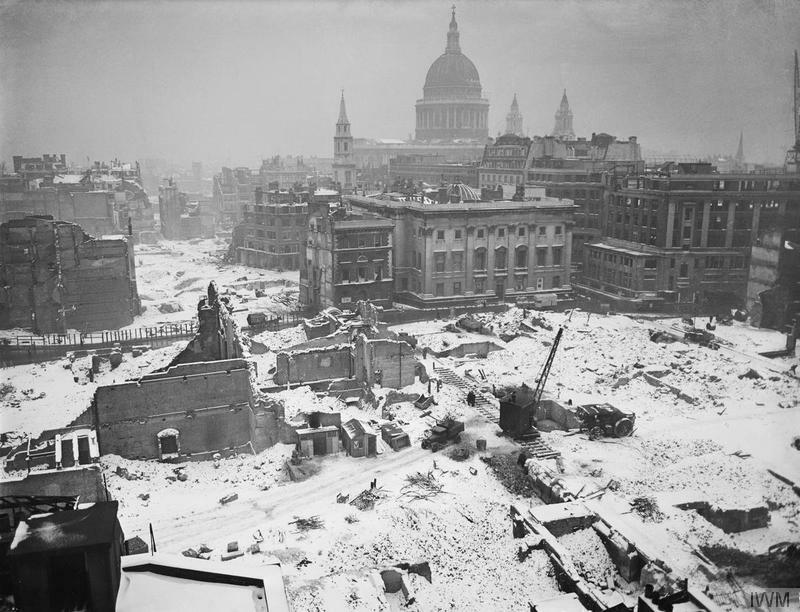 The air raid of the 29th December 1940 destroyed a significant part of the surroundings of St. Paul’s and the area has since changed dramatically. The air raids destroyed not only buildings but also business that had been operating for many years, not to mention the thousands of lives that were lost. That St. Paul’s remains is thanks to the bravery of those who protected the building as the area was covered by a deluge of bombs. For Londoners, it must have seemed that their City was changing forever almost on a nightly basis. The following photo is from the Imperial War Museum collection © IWM (D 6412) and was taken in January 1942 and perhaps typifies the atmosphere that must have pervaded many parts of the city. The Stone Gallery (and the higher Golden gallery) provide a perfect location to view the wide sweep of London, from Shooters Hill, to Alexandra Palace, the City, Westminster, North and South Bank. The last stone of the cathedral’s structure was laid in 1708 and since that time it has looked down on a City that has changed beyond all recognition and hopefully will continue to do so for many centuries to come. This entry was posted in London Churches, London Vistas, The Bombed City on October 19, 2014 by admin. 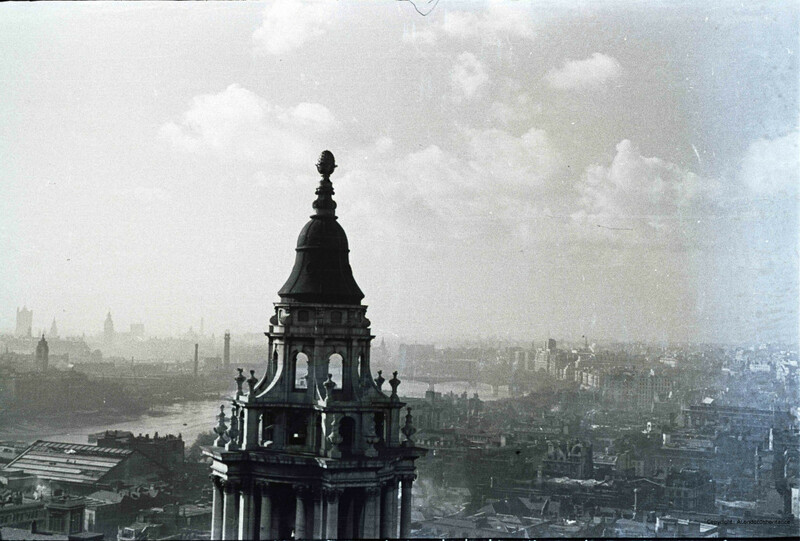 One of the things that I noticed when I looked up from the detail of the post war photos of London was the sky. I was born in the 1950’s and that was still the colour & texture of a sky over a city still suffering not only from the effects of WW2, but also from the smoke and industrial fumes of the city. I can just about remember the last ‘smog’, when, if you opened your front door it came in with real prescence. 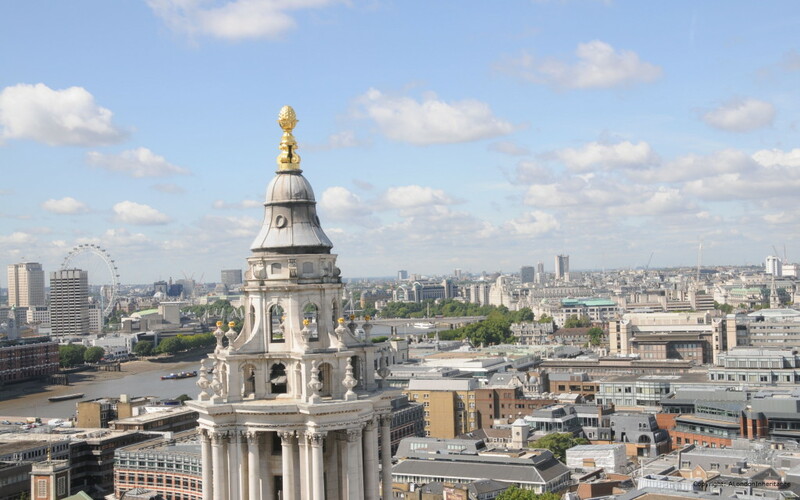 I miss the London I knew as a child, and wish I had known the pre-war London, but I do love the clearer skies, the cleaner buildings – which with restoration, cleaning & gilding have made London today a very beautiful city – but then I am biased! Hi Donna, I agree, it would have been great to have known pre-war London. Whilst it is still a very beautiful city some of the recent development has been somewhat bland. The Paternoster Row and Square areas sound fascinating and were a centre of the publishing industry. Very different today. This blog goes from strength to strength….fascinating stuff! 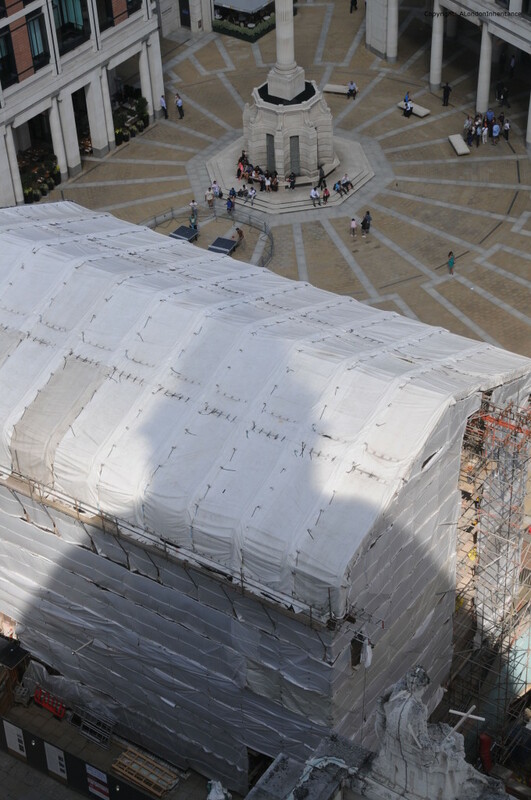 It’s interesting to me that the new Paternoster Square is private space, with its own security guards, hence the Occupy protest had to be very close to St Pauls on what is still public land. So many changes, not all of them obvious….thanks David. Thanks Vivienne. I had problems with security guards when I was trying to take photos of All Hallows by the Tower. Trying to get back far enough for a photo I was told by some security guards I was on private land and could not take pictures, despite the fact I was aiming at the church, not their building. As you say, one of the not so obvious changes. I think you are, unusually, in error about the top two photos. (“These appear to be the only buildings that remains from the immediate post war period.”) There are two survivors besides St. Giles Cripplegate and the unidentified building on the left. Take a look at your own photo, to the lower right, where there’s a bright red bus. The two buildings adjacent to it are visible in the older photo. One is badly damaged, but its street-level doorway and roofline are clearly the same. The building adjacent to that, closer to the bottom of the photos, is the same in both photos. Lisa, you are right. Not sure how I missed those buildings but they are the same as in the original photo. Thanks for pointing that out. I work for BT so that pictured as commented on by Lisa is of interest. I started my career in Oct 1977 in a building called Falcon House in St Martins-le-grand, opposite Postman’s Park and next to a pub called the Lord Raglen (where I had my ‘real’ training). I can tell you that most of the buildings survived the war and it wasn’t until the 80’s I think that Falcon and Alder House next door were demolished and rebuilt. The building opposite where I worked also survived. 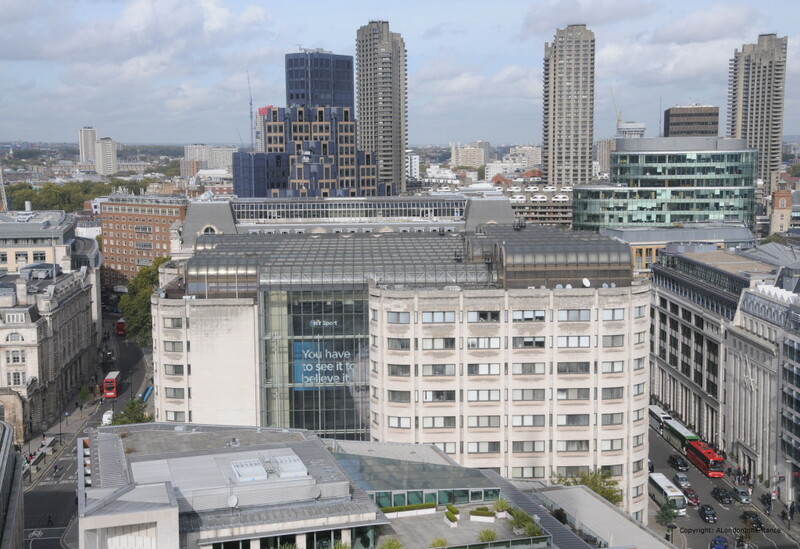 It’s directly behind the BT HQ in the picture centre and at the end of the 70’s the outer shell was retained and a new building (for Nomura Bank) was built from the inside out. if you look closely at the top left-hand corner you can recognise the stonework for the little towers. The building by the bus stop also survived. The one referenced has to it’s right a former GPO building called Armour House. It’s on the corner of Gresham Street and I think when I visited the area last it had been redeveloped. A quick ‘drive’ around BT Centre using Google Street View is a great way to get ground level views of this location and others. Great site BTW – enjoyed reading it as working there for some years and being aware of the history made my lunch time walks that bit more interesting. In particular I’d watch the excavations on the site of the former CTO (Central Telegraph Office now BT Centre and not GPO HQ as stated) where numerous Roman walls, baths and artefacts were found. What could be removed went to the London museum nearby. Then the site was covered in concrete. Stan, thanks for your comments and the correction on the Central Telegraph Office. Your comments on the buildings that survived to the 1980s holds true for much of the City. It was that decade when the level of development that continues to this day really started. Prior to that it had been mainly building on the old bomb sites. Also understand your comments on the ‘real training’. I started with BT in 1976. It was a very different time ! 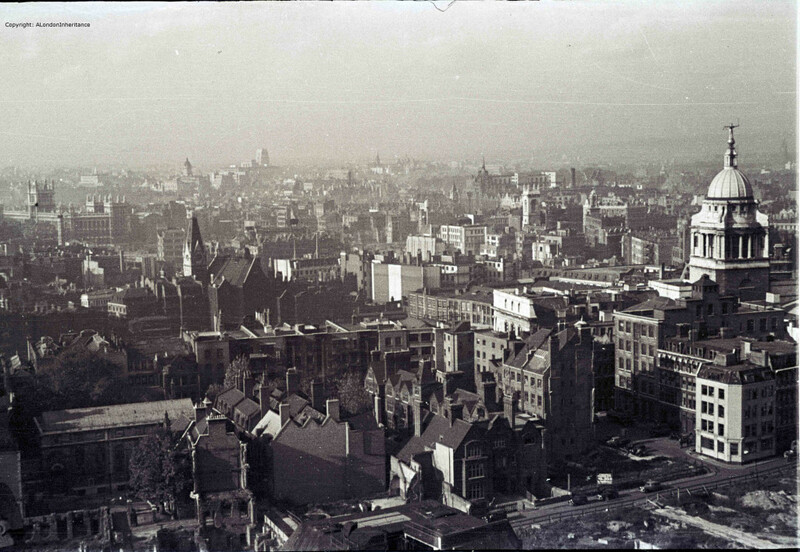 Hi David – do you think that the last photo in this post, from the IWM, could have been taken from the tower of St Albans on Wood Street? The elevation and alignment of St Vedast and St Pauls suggest to me that it was…. Just had a look at that photo and you could well be right. The alignment of St Vedast and St Pauls does look about right. I was horrorified to read about the destruction of all those books and the impact on the publishing and writing communities of losing Paternoster Row. Your London posts are fascinating and looks like I’ll be parked here for the evening. Just found this having finished editing this year’s book for the London Topographical Society which will illustrate Lawrence Wright’s watercolour views from the Stone Gallery (purchased in 1956 by the Museum of London). He depicts London in shades of blue and grey, as if dreamily waiting to be rebuilt after the immediate post-Blitz debris had been cleared away. Fascinating to see the photographs taken by your father, and the comparisons of recent views – mostly pretty characterless. Thank you for your posts, always worth a read.